An International Launch Services Proton Breeze M rocket launches from Baikonur Cosmodrome, Kazakhstan on Dec. 8, 2013 carrying the first Boeing-built Inmarsat-5 into orbit for communications provider Inmarsat's Global Xpress service. A Proton rocket lifted off from Kazakhstan on Sunday (Dec. 8), launching a powerful satellite to kick off a $1.6 billion next-generation fleet for Inmarsat, the London-based operator specializing in the booming mobile communications market. The successful launch begins a year-long deployment schedule for Inmarsat's Global Xpress service, an initiative in the works for three years that aims to boost connectivity speeds for users on-the-move in airplanes, on boats and on land. Switching from L-band to Ka-band improves downlink communications speeds to 50 megabits per second, with up to 5 megabits per second on the uplink side. And users can link up with the Global Xpress satellites with smaller terminals. Inmarsat counts maritime operators and airlines among its customers, allowing ships and planes to remain connected while traveling through remote oceans and skies. "We understand the extraordinary value that high-speed broadband has for mariners," said Rupert Pearce, CEO of Inmarsat. "Our new service offering, Global Xpress, will enable ship owners to enhance the morale of their crew by reducing a sense of isolation through the provision of global mobile broadband connectivity, as well as bringing an array of compelling new commercial opportunities to the ship itself." The improved broadband connections will give airline passengers more options for entertainment and work while in the air. "We see tremendous advantages for the aviation industry, too, enabling commercial airlines and business jet operators to offer their passengers the freedom and choice of remaining always connected whether through on-board wired or wireless in-flight entertainment systems or over the passengers' own personal device like a laptop, tablet or smartphone," Pearce said. Global media companies and military forces also rely on Inmarsat satellites to do broadcasts and make phone calls from far-flung locations and battlefields. "The list of those who can benefit from high-speed mobile broadband is, indeed, almost endless," Pearce said. Inmarsat says its older L-band communications satellites will augment the Global Xpress service, ensuring customers do not suffer outages in inclement weather. Ka-band signals are more vulnerable to interference from rain than communications at lower frequencies. "Rain fade is an issue which is brought up a lot in a competitive environment, and because of Inmarsat's ability to use L-band as well to augment the service, we expect to be up 100 percent of the time," said Frank Coles, CEO of Inmarsat Maritime. The first of three Global Xpress satellites queued up to launch in the next year lifted off at 1212 GMT (7:12 a.m. EST) aboard a Russian Proton rocket from the Baikonur Cosmodrome in Kazakhstan. Tipping the scales at 6,100 kilograms, or 13,448 pounds, the Inmarsat 5 F1 spacecraft rode the Proton rocket and a Breeze M upper stage to an orbit stretching more than 40,000 miles above Earth. The launch sequence took more than 15-and-a-half hours to complete, requiring five burns of the Breeze M engine and several multi-hour unpowered coasts to achieve the optimal orbit for deployment of Inmarsat 5 F1. The satellite separated from the Breeze M stage at 0343 GMT Monday (10:43 p.m. EST Sunday), and a ground station in Hawaii received signals from the spacecraft, verifying it was healthy after the trip to orbit, according to Inmarsat. 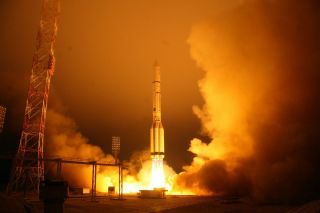 "We are honored to share this momentous occasion with Inmarsat, true innovators in the satellite communications industry, with the first ILS Proton launch of three in the Global Xpress constellation," said Phil Slack, president of International Launch Services, the U.S.-based, Russian-owned firm which sells Proton rockets commercially. "Today's ILS Proton launch builds on a strong relationship between Inmarsat and ILS dating back to 2008 with the launch of an Inmarsat 4 satellite. We thank the teams who worked tirelessly on the successful launch of [Inmarsat 5 F1] and look forward to our upcoming missions with Inmarsat." An artist's depiction of the Inmarsat-5 communications satellite built by Boeing for the communications provider Inmarsat's Global Xpress service. The satellite launched into space on Dec. 8, 2013. Built by Boeing Satellite Systems International Inc. in California, Inmarsat 5 F1 will guide itself into a circular orbit over the equator in the next few weeks, using seven burns of its main engine and additional pulses of its electrical propulsion system to reach geostationary orbit by the end of January. The spacecraft will unfurl its power-generating solar panels and antennas by the end of December, according to Inmarsat. Inmarsat 5 F1 will take up operations at 63 degrees east longitude covering the Indian Ocean region, with the start of its communications mission expected in June, according to Jonathan Sinnatt, an Inmarsat spokesperson. Another Inmarsat Global Xpress craft will launch on a Proton rocket in May, followed by a third spacecraft before the end of 2014 to spread the service's coverage around the world, Sinnatt said. Inmarsat ordered a fourth satellite from Boeing in October for use as a spare or to further expand the Global Xpress network if needed.